Tasting Note: This whisky was matured for a minimum of 25 years in ex-sherry Hogsheads. It is beautifully aged with wonderful hues of red, orange and brown. Amazingly, no oaky notes appear at all for a whisky of this age. You’ll instead find subtle vanilla, toffee and orange chocolate. 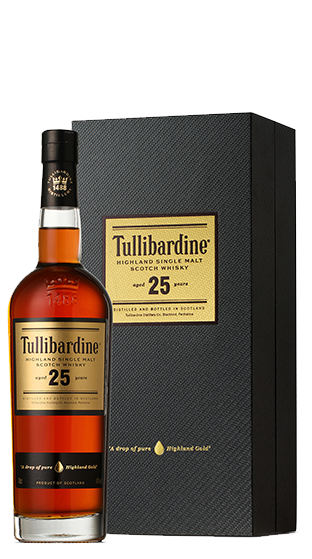 Tullibardine 25 Year Old has an incredible viscous quality that fills the mouth with baked banana, orange peel and a long, creamy, silky finish.